Talking with the Dalai Lama: How serious is China? 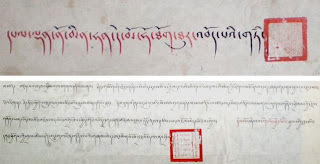 It is hard to tell whether their accuracy is lost in the translation or not but it is always amusing to read the way China frames its public pronouncements on Tibet in general and the Dalai Lama in particular. As the long-stalled talks between Beijing and the Dalai Lama's special envoys begin, Chinese foreign ministry spokesman Ma Zhaoxu has one piece of advice for the 75-year-old Tibetan leader: "We hope the Dalai Lama will cherish this opportunity and respond positively to the requests of the central government." The choice of the word "cherish" is unmistakably made to underscore the patronizing tone of the statement. It is almost as if a stern parent is telling an errant child after a timeout: "Now that you have learned your lesson, here, cherish this lollipop." The idea that someone who has been forced to spend over five decades of his life away from homeland should be grateful that those who caused him to leave may occasionally condescend to talk to his representatives would have been amusing but for the underlying seriousness of the issue. By its very definition people "cherish" things which are either rare or special or both. It is true that the talks between China and the Dalai Lama are rare, but whether they are special is a matter of opinion. For Beijing, the very fact that it deigns it fit to even engage him in a dialogue at all, even if it is about laying the groundwork for future dialogues, is special in itself. There is always a barely concealed dismissive tone when it has anything to say about the Dalai Lama and his efforts to reach out for a negotiated settlement. 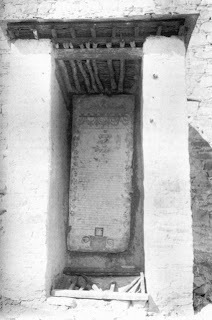 When the talks broke down in November 2008, although there was no specific reason given, there was a widely held belief that the Chinese government was unhappy at the Tibetan demand for autonomy and the accompanying assertion that it was not in conflict with the Chinese constitution. As always this time around too the Dalai Lama's office is taking a tactful approach. His spokesman Tenzin Takhla was quoted as saying that the talks are an "important process of trying to find a mutually agreed solution." Care was taken by Beijing to point out that the 10th round of talks since 2002 were sought by the Dalai Lama, lest it be misconstrued by anyone that China felt obliged to resume them. Beyond the finely tuned choreography of such talks, it is not known what the specific agenda of the latest talks is going to be. There has been nothing to indicate that the Obama administration has specifically requested China to resume the dialogue. In what was widely seen as a move aimed at pleasing China, President Barack Obama chose not to meet the Dalai Lama weeks before his first state visit to Beijing in November last year. It was then believed that Washington could leverage this gesture to restart the dialogue between Beijing and the Dalai Lama. A little over two months after that visit the resumption of the dialogue may in part be interpreted as a consequence of that. However, considering that the last nine rounds of talks in eight years ended without anything tangible being achieved, it is anybody's guess what the tenth round could produce. One indication of how flippant the mood in China gets when it comes to Tibet and the Dalai Lama was a piece titled 'A look at the Dalai Lama's ridiculous Indian heart' in the People's Daily Online on January 22. 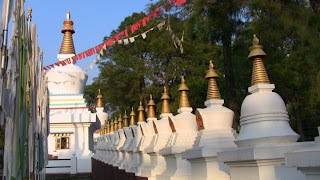 It was apparently prompted by some reports that the Dalai Lama might consider becoming an Indian citizen, something which has no official sanctity. 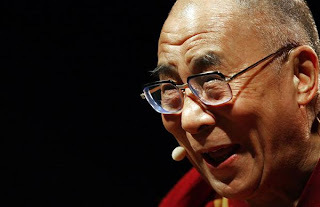 "According to reports on January 16, 2010, during the opening ceremony of the International Buddhist Conference in Gujarat State, India, the Dalai Lama remarked that due to the fact that he was from purely Tibetan parents, he was Tibetan in appearance, but an Indian in spirituality. 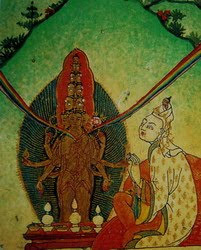 Thus, his comments and ideas originate from Indian traditions," the site wrote. 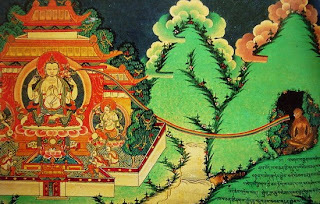 "The Dalai Lama pleases his Indian masters not only by showing his willingness to be a "son of India," but also by effacing the originality of the Tibetan culture. 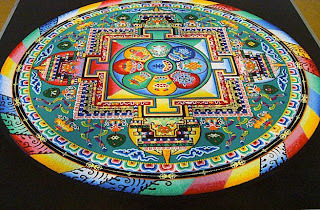 The Dalai Lama uses such words to dwarf the rich Tibetan culture with distinctive local characteristics. He could not be more subservient. In fact, another reason why the Dalai Lama calls himself a "son of India" is that he intends to deny his Chinese citizenship," it said. China has failed, despite billions of dollars in aid, to win over Tibetan loyalty. And now Beijing is finally realizing just how badly it mishandled things. 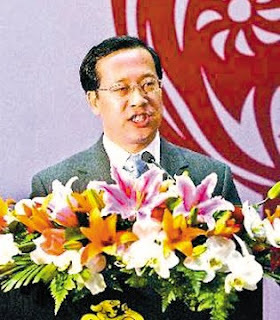 His Holiness the 14th Dalai Lama could achieve rapprochement with President Hu Jintao. 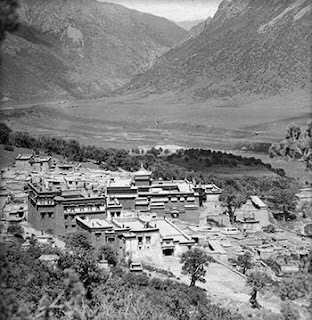 After the mass riots there in March 2008, Tibet faded once again into relative obscurity—the province of foreign-affairs wonks, adventure tourists, and a few well-organized protest groups who object to China's rule there. But during that time, Beijing has come slowly to two painful realizations. 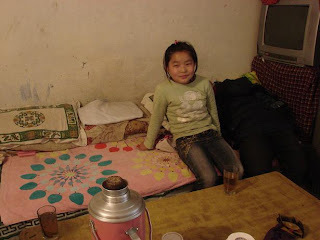 First, the restive plateau it had treated for decades as a colony is central to its national plan: development and stability are "vital to ethnic unity, social stability, and national security," President Hu Jintao recently told his Politburo. And second, a corollary realization: China's government has been mishandling the issue of Tibet all along. 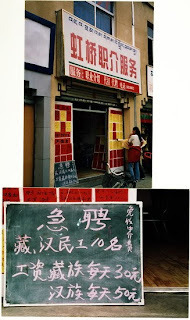 It's true that the government in Beijing bridles at anything that reeks of secessionism. Just last week, Hu kept up his public attack on the "separatist forces led by the Dalai clique." 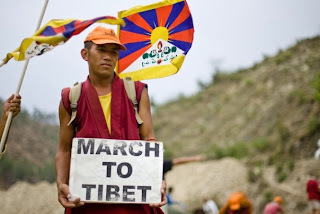 The Chinese leadership is against the "meaningful autonomy" demanded by the Dalai Lama, who is described over and over as a "separatist" bent on fomenting trouble and splitting Tibet from China. 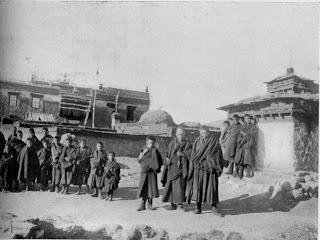 But though local riots looked bad in the press, they never really threatened control of Tibet. And the Dalai Lama has consistently maintained that he does not want to separate Tibet from China. World leaders who have met him seem convinced of his sincerity and nonviolent approach to solving the Tibet issue. 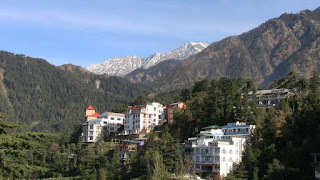 That's why last week, after nearly 15 months of trading barbs—Beijing had shut down relations after the Olympic spotlight went dark—China's leadership invited the Dalai Lama's government in exile (based in the north Indian town of Dharamsala) back to talks about the province's future. Soon, two of the Dalai Lama's representatives, Lodi Gyari and Kelsang Gyaltsen, left for China along with three of their aides. These talks are not going to solve the 50-year-old problem, which began with the Dalai Lama's escape from Tibet after a failed uprising against the invading Chinese Army in 1959. 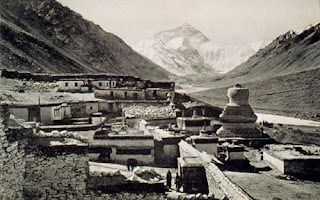 But the administration of President Hu (who was himself in charge of Tibet in the late 1980s) seems serious about helping to develop the province. Fifty Years After brims with surprise at the affluent, breathtakingly planned city that Lhasa has become—with sparkling six-lane roads and glass-front shops that sell all the top international designer labels. 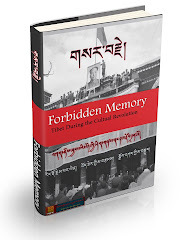 "But we could not find any Tibetan who showed his loyalty to the Chinese," says Dewan. 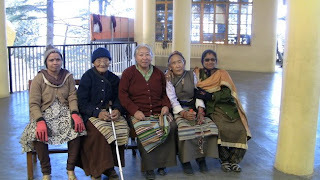 The authors also found that Tibetans remained excluded from most senior-level jobs. For example, of the nine top officials in the Tibet Mineral Development Co. Ltd., seven are ethnic Han Chinese, the largest group in China. 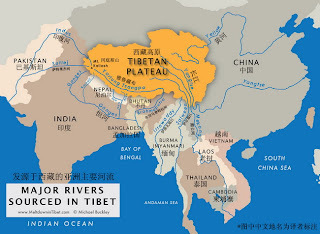 (Officially the province is run by an ethnic Tibetan governor named Pema Thinley, a hawkish military commander, but real power lies with Communist Party Secretary Zhang Qingli, an ethnic Han.) 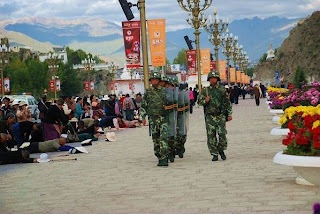 Similarly, they point out that of the nearly 13,000 shops and restaurants in Lhasa, barely 300 are owned by Tibetans. "And despite the threat of punishment, we found deep respect and admiration for the Dalai Lama," says Dewan. 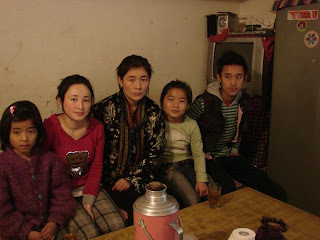 Tibetan exiles say that nearly 60 percent of Lhasa's more than half a million people are now Han Chinese immigrants, although the Chinese-government census disputes that claim. 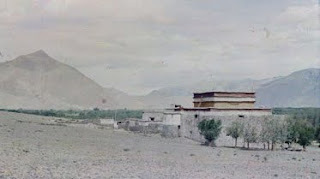 But Dewan and Srivastava point out that the vast number of Chinese troops and officials, as well as the floating population of Chinese traders and businessmen, are not counted in Tibet's census. 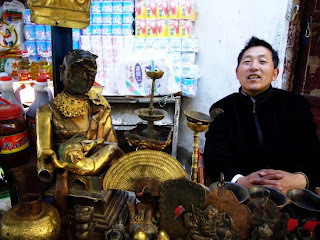 "You can see nattily dressed handsome Chinese men and women everywhere in Lhasa," says Dewan. 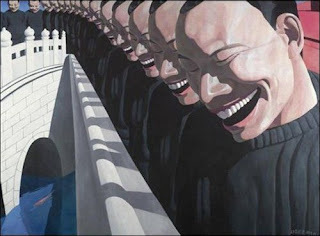 Suddenly, then, the Dalai Lama is not the problem but rather a pivotal part of the solution. 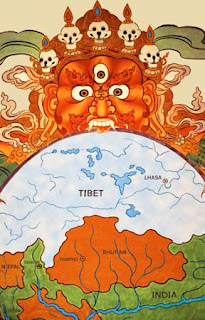 As Tibet expert and author Robert Thurman says, the Dalai Lama is the key to giving China legitimate sovereignty over Tibet as an autonomous region within China because he would inspire his people to stay inside China in case of a referendum on independence. 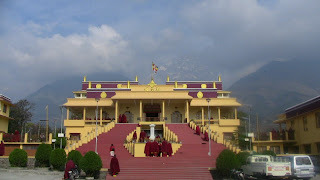 His growing following within mainland China (the number of Chinese Buddhists attending the Dalai Lama's teaching sessions in Dharamsala is growing quickly) can also help calm the simmering discontent among the Chinese who have been left untouched by the benefits of China's impressive economic growth, which has created a hunger for spiritual growth. The Dalai Lama will be 75 in July. 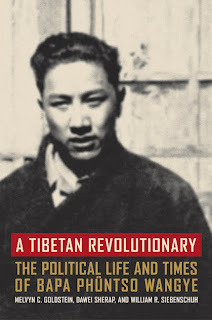 He is revered by the Tibetans and admired around the world. Any deal with him will have the unquestioned legitimacy and support that is so vital to China's aspirations. And his absence will spell uncertainty and a lack of moral authority over Tibetans—which can only hinder China's aim of becoming a global superpower. It would be naive to expect President Hu to recant overnight the Tibet policies that he himself devised and executed over the years. But it's not quite so farfetched to see him inching in that direction during his last few years in office as China's supreme leader, or even organizing a face-to-face meeting with the Dalai Lama before he leaves. It would not only make him a frontrunner for a Nobel Prize but also bring China the respect and admiration that it so acutely lacks. 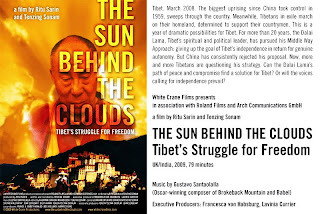 China formally told the festival this week that two Chinese films were being withdrawn from its program in protest of the scheduled screening of a documentary about Tibet and the Dalai Lama. While Chinese officials told the festival’s director that the filmmakers themselves had decided to withdraw their state-financed works, many China experts believe that it is the state sending a message, rather than the individuals. 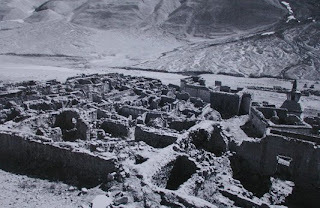 There is added intrigue over the more prominent of the two films that were withdrawn from the Palm Springs festival: “City of Life and Death” (also known as “Nanjing! Nanjing!”), a critically acclaimed fictionalized account of atrocities committed by the Japanese occupiers of Nanjing in 1937. Written and directed by Lu Chuan, one of China’s top box office successes, the film has drawn criticism in China for what some people there have called its sympathetic portrayal of Japanese characters. 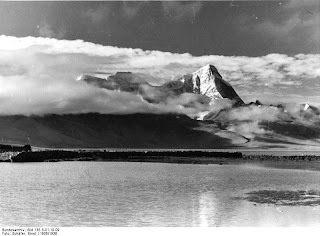 Tibet has long been a cause célèbre in Hollywood, particularly among actors and some prominent filmmakers. 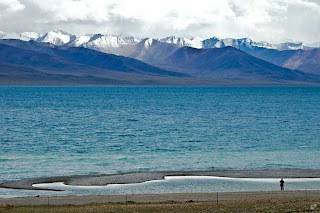 At the same time, the big movie studios, which are all part of international corporate conglomerates that are trying to do business in China, in recent years have appeared to steer clear of major projects on Tibet that would inflame tensions and threaten their interests there. National Geographic Entertainment announced in August that it had acquired the North American distribution rights for “City of Life and Death” and that the film would be released in theaters in 2010. But people involved in that deal said that a formal agreement was never signed, leaving National Geographic on the sidelines of the current dispute. The company said it still intends to release the film in theaters later this year. 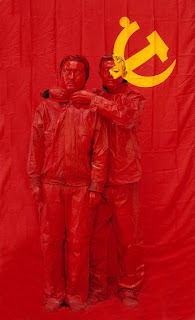 The current wrangle is only the most recent protest by Chinese officials that the arts, and film specifically, are being used as a weapon to meddle in their internal affairs. In August, two American filmmakers were blocked from traveling to China to present their documentary about the more than 5,000 children in Sichuan Province who died when a 2008 earthquake caused numerous schools to collapse. Computer hackers and demonstrators took aim at the Melbourne International Film Festival in Australia in July to protest its screening of a documentary about a leader of Muslim Uighurs in the Xinjiang region of northwest China, where some 200 people were killed in ethnic violence last summer. 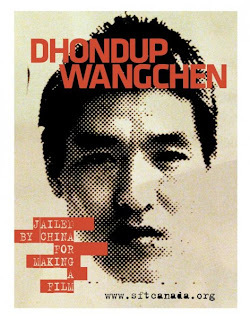 And at last fall’s Frankfurt Book Fair, a diplomatic struggle emerged over the fair’s invitation to two dissident Chinese writers to speak at its official program honoring China. 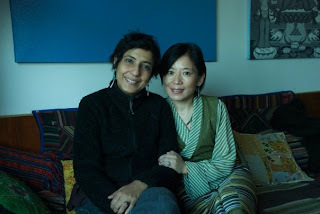 That documentary, by Ritu Sarin and Tenzing Sonam, follows the Dalai Lama over a year through protests over the status of Tibet that were timed to coincide with preparations for the Beijing Olympics. Officials at the Chinese Consulate in Los Angeles did not respond to repeated requests for comment Thursday and Friday. Some American experts on China’s political and cultural atmosphere say they doubt that the filmmakers decided without prompting to withdraw the films. The second film is a comedy titled “Quick, Quick, Slow,” directed by Ye Kai. 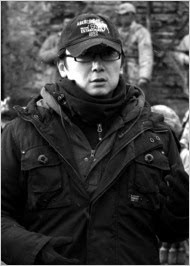 The film’s producer, Zhang Lanxin, had been expected to attend the festival. 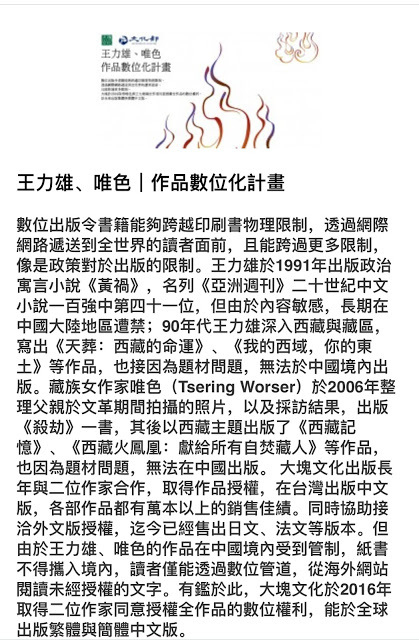 “There is no way that he could continue having his films in international festivals and be successful in China” without succumbing to pressure to have his film withdrawn, given that the government financed the film and must approve all Chinese films that are exported, Dr. Rosen said. The Associated Press published excerpts of a telephone interview with Mr. Lu on Thursday in which he said he “unconditionally accepted” the decision to withdraw his movie. Kenneth G. Lieberthal, a senior fellow at the Brookings Institution, noted that Chinese President Hu Jintao once served as Communist Party chief for Tibet. 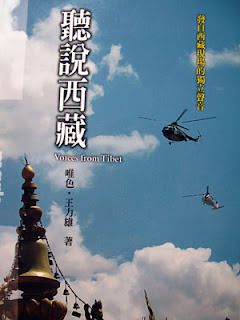 “Tibet is an issue that is especially neuralgic for Beijing,” he said, adding that he would have been surprised if Chinese officials had not objected to the film. 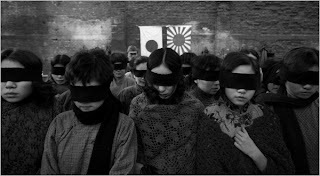 Dr. Rosen said that “City of Life and Death” has attracted some criticism in China, because it portrays one Japanese character who was part of the occupation force as having a bout of conscience over Japanese atrocities and eventually killing himself. 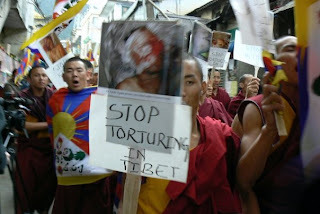 Dharamsala demonstrations in sympathy with the Spring Uprising in Tibet . 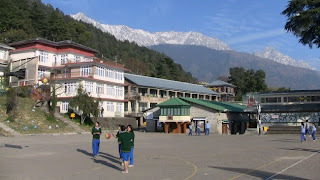 Graham, Suresh, Ritu and Konchok at Lhagyalri Dharamsala . 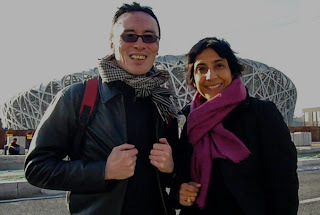 Tenzing and Ritu at the Bird's Nest, Beijing （唯色拍摄）. 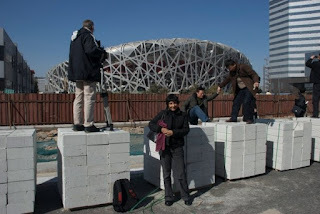 Graham and Ritu filming at the Bird's Nest, Beijing . 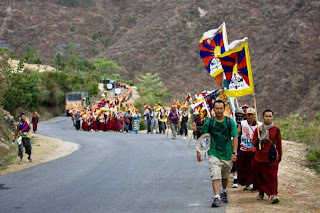 Return to Tibet March on the road. Filming Tenzin Tsundue at the Return to Tibet march. 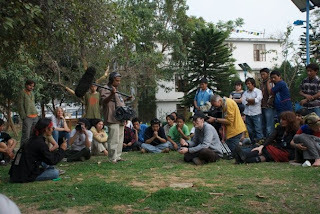 Jaimie Gramston filming the Dalai Lama at his residence in Dharamsala. 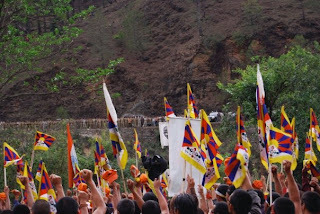 Return to Tibet marchers confront the Indian police at Banspatan, Uttarkhand . 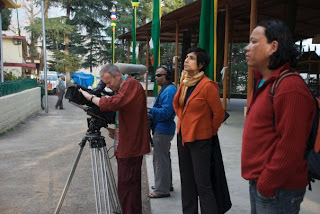 Tenzing, Ritu and Graham in Dharamsala. 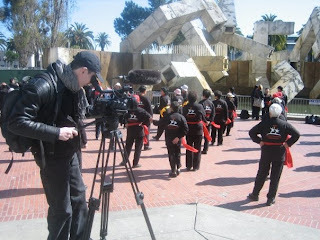 Tenzing filming the Torch Relay in San Francisco . 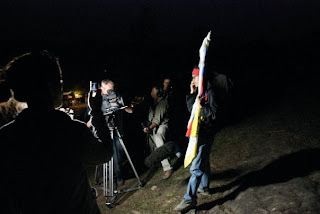 Tenzing filming the Return to Tibet marchers somewhere in Uttarkhand . 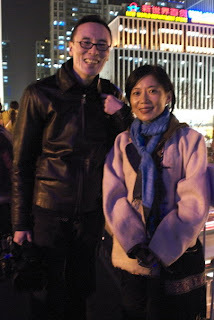 Tenzing interviewing Tsundue during the march. 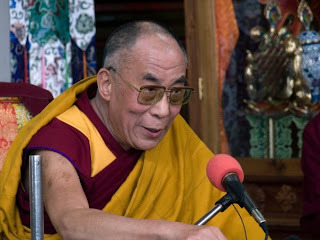 The Dalai Lama at post-Tibet Uprising press conference in Dharamsala . 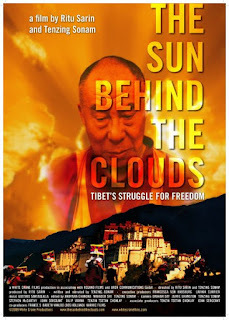 《The Sun Behind The Clouds: Tibet's Struggle For Freedom》.